The brilliant sunshine and azure Mediterranean skies in Mallorca seemed to belie the strange atmosphere of a holiday island targeted again by ETA bombs, twice in two weeks. A subtle undertow to my daily life reminded me that Spain has seen many such instances of violence from ETA in the last 50 years. So many people have come down south from the Pyrenees and northern regions of Spain over time to bring amazingly positive developments and some terrible events. Another example of people moving a long, long time ago from the north was publicised while I was in Palma. Apparently the oldest known map has been deciphered and the news published this month in the Journal of Human Evolution, but I read of it in El Mundo in Spain. 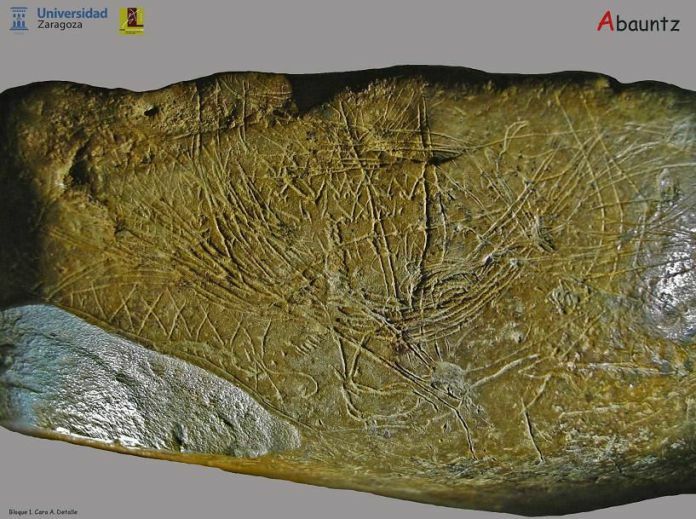 The 13.660 year-old stone map, incised on a marl stone (soft outside and harder inside), was created by hunters coming into Navarra in Northern Spain and sheltering in a cave in Abauntz. The stone, some 7" x 5" by less than an inch thick, was found in 1993, but the University of Zaragoza team did not realise what it was until, by chance, Pilar Utrilla, saw that one of the details was the silhouette of a mountain visible from the mouth of the cave, Monte San Gregorio. Not only was the mountain recognisable, but the early artist had also drawn herds of ibex on the mountain. From this realisation, the researchers were able then to understand the layers of information that had been incised, for the benefit of future hunters coming to the area. The map shows mountains, meandering rivers, meadows and areas of good foraging and hunting, a real treasure map in essence. The Magdalenian artist, who was working about three thousand years after the Altamira cave paintings were created, knew how to work in perspective. The nearer animals are larger and more detailed than the distant ones which are more schematic. There are even incised dots which may represent the bellowing male deer trying to attract the does. The map clearly shows the skills of spatial awareness and planning, to say nothing of the artist's hunting skills and knowledge of the animals. Near the map, the archaeologists also found a stone lamp and another stone representing a horse's head. Somehow, as I read about this fascinating find from nearly 14,000 years ago, I found it made the current violence and political frenzies surrounding us pale in significance. Once again, a long-distant and anonymous artist had, by simple, decisive skill in incising a stone, reminded me of the arc of time and the magical transmission of knowledge and beauty. It is like a bell that rings true: we all know that these are small but extraordinary links, human to human, down time. And how suitable that such a map, the only complex depiction of a landscape known in Europe, should be discovered in our era of space exploration. Again, things are put in perspective.